How Far Along: Thirty-four weeks. My due date was adjusted slightly (moved up three days), so counting weeks is a bit off. Hopefully less than six to go. Size of Baby: A honeydew melon. She's about 18 inches from head to toe and weighs approximately 4.75 lbs. Cravings: Seasonal anything (pumpkin, hot soup, caramel apple spice from Starbucks, etc.). Lots of water. Can't seem to drink enough! Weight Gain: 16 lbs (ish). I'll know for sure after my appointment later this week (my scale always reads differently than theirs). Maternity Clothes: Of course. The temperatures dropped drastically this past week, so coats, scarves and ankle boots have joined the regular rotation. Physical Symptoms: Lower back pain if I sit in a desk chair for too long. A good old-fashioned hot water bottle helps tremendously. Also, shortness of breath! She's taking up all my lung-space at this point. The strangest development in the past two weeks has been weak hand control. I've been getting random finger spasms and sometimes need to shake my hands to get circulation flowing (I am told this is normal). I can definitely feel myself slowing down. 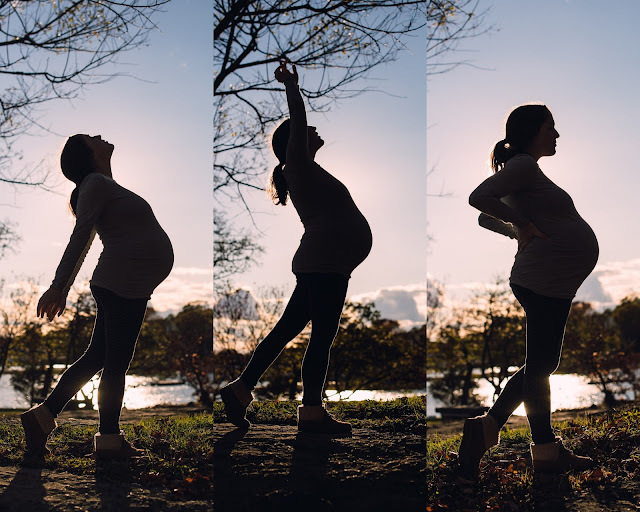 I'm officially taking maternity leave from the photo business after November 8th, but between now and then, it's basically crazy-time. Really attempting to listen to my body and rest whenever possible so as not to overdo it. Sleep: Fine, except for the falling asleep part. I toss and turn trying to get comfortable for at least the first hour every night. She's usually SUPER active during this time, so part of the problem is me becoming distracted by her jabs and acrobatics. Fears: This is a silly one, but I really want the house to be spotless before I go into labor. Since we obviously can't predict when that will be, I imagine I'll be a psycho person those last couple of weeks trying to tidy up, dust and run the dishwasher on the regular. Obviously, I know we have zero control over this, but I at least want to come home to clean sheets and an empty kitchen sink. She's due Thanksgiving Day, so we're in the process of trying to plan the logistics of that holiday with family. All I know is that we won't be hosting. Baby's Developmental Milestones: She's peeing up to a pint per day now. Bring on those teeny newborn diapers! She's nearly ready to meet the outside world: in roughly two weeks, she's considered full-term. Things I'm Looking Forward To: Finishing up the decorating of her space. We have just about everything we need, so now it's time for the last few loads of laundry and organizing. My grandpa passed away peacefully over the weekend, so while this might sound weird, I'm also looking forward to traveling to Boston this weekend for his funeral/celebration of life and to see my family. If it happened any later, we might not have been able to make the trip, so I'm grateful for that. Coolest Thing So Far: Taking those photos up there? Spelling out her name with alphabet blocks? Folding tiny socks and hats? Tiho resting his head on my belly and trying to guess which body part is kicking him? Feeling the most beautiful I ever have in my life? Every bit of this? Because...yes. Tearing, loving, beautiful, cannot wait!